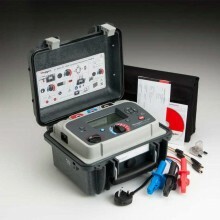 Includes: Megger BM15 User Guide, 3 x 3m HV leads, Carrying case with lead storage, Slide in Pass Band overlay (5 supplied), Test Record Card (pack of 5), 8 x AA cells (LR6). 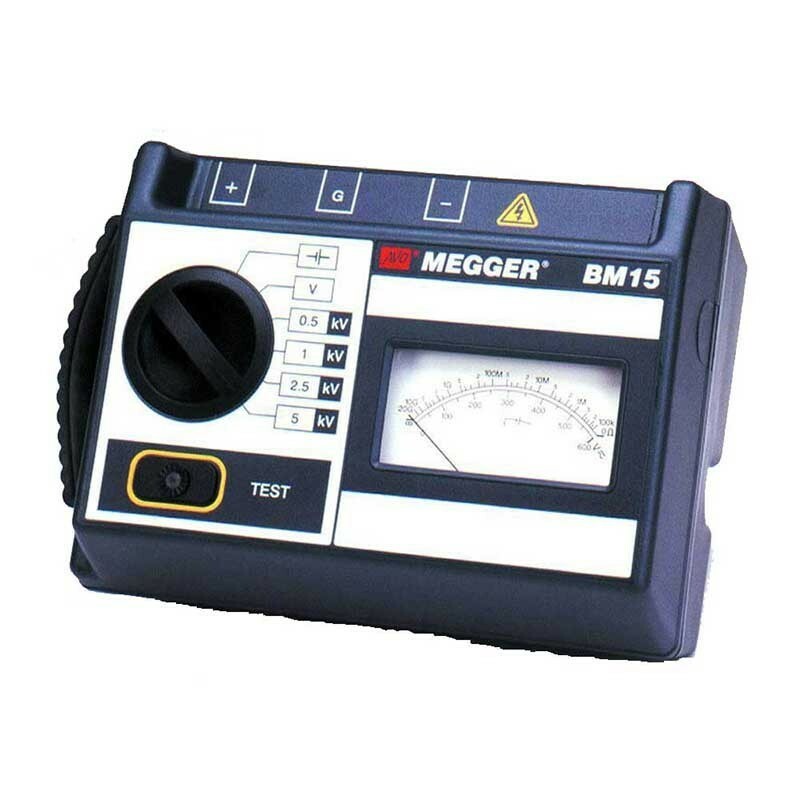 The Megger BM15 analogue 5 kV insulation tester is a completely self-contained instrument designed for high voltage insulation resistance testing in the maintenance and servicing of rotating plant machinery, transformers, switchgear and industrial installations. 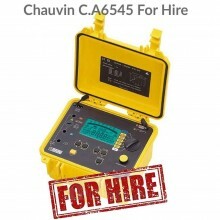 Tests can be performed at 500 V, 1000V, 2500 V or 5000 V. Insulation measuring range is 100 kΩ to 20 GΩ and Infinity. 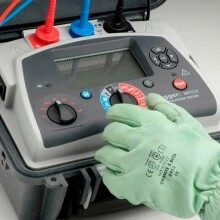 Automatic discharge for capacitive circuits under test is provided and decaying voltage displayed. Tests are initiated by pressing the BM15 ‘Test’ button. 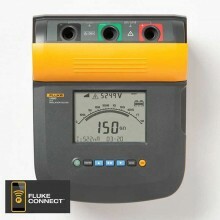 Releasing the ‘Test’ button causes the instrument to default to ac/dc voltmeter mode, with a discharge resistor internally connected across the terminals. 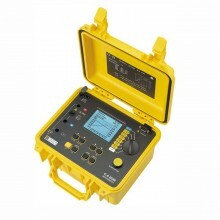 This feature will give decaying voltage indication following the testing of equipment possessing capacitance. 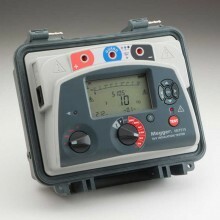 The instrument will operate in any position, but best results are achieved when the instrument is face up, on a firm level surface. Large, single scale analog display. 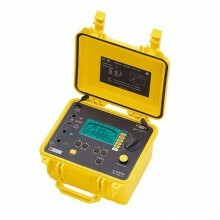 Auto voltage measurement function indicates conductor and auto discharge potential. Supplied with optional locking test button. Safety recessed terminals and long connectors. Unique scale overlay for pass/fail bands. 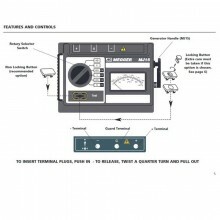 Resilient mounted analogue scale for robustness. Single scale for insulation values to avoid operator error. 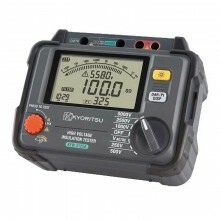 Range down to 100 kΩ ideal for go/no go testing. Insulation Range 100 kΩ to 20 GΩ (also 0 Ω and ∞). 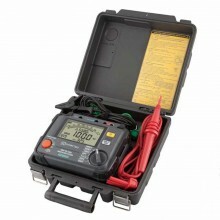 Test Voltages (DC) 500 V, 1000 V, 2500 V & 5000 V.
Test Voltage Accuracy ±5% of nominal test voltages on 20 MΩ load. 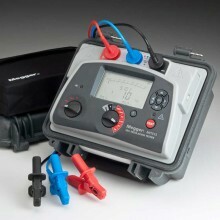 Test Voltage Stability <±1% (180 r.p.m. to 240 r.p.m. 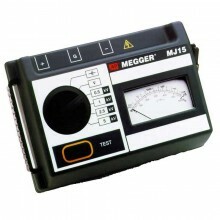 MJ15). Insulation Accuracy (at 0 - 30°C) (32 to 86°F) ±2.5% of full scale deflection. Short Circuit Current 1,5 mA ± 0,5 mA. Maximum Capacitance of Load 5 μF. Interference Rejection 1 mA rms at 50 to 60 Hz. 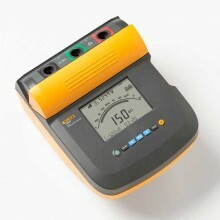 Voltage Range 0 to 600 V a.c. Accuracy ± 2,5% f.s.d. a.c.
(with rotary switch in the V position). Overload Rating 720 V a.c. or d.c. Scale Length 2,8 in. (72 mm) (96°). Power Supply 8 x AA cells (LR6). Battery Life Typically 2000 five second tests at 5 kV on 100 MΩ load. Battery Indicator Loaded Battery Test. 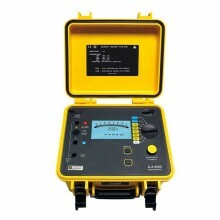 EMC In accordance with IEC 61326-1. Operating temperature 32 °F to 86 °F (0 °C to 30 °C). Storage temperature -13 °F to 149 °F (-25 °C to 65 °C). Dimensions 220 x 160 x 115 mm. Weight Approx 2,6 lbs (1,2 kg). 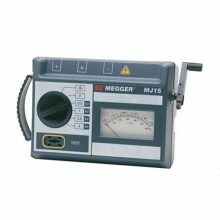 Megger BM15 warranty 1 year. ***Relates to transient overvoltage likely to be found in fixed installation wiring. *Relates to transient overvoltage likely to be found in special equipment or parts of equipment, telecommunication, electronic etc. 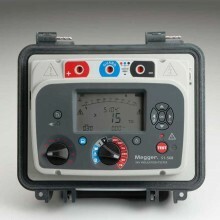 PDF Specifications of the Megger BM15 & MJ15 Analogue 5 kV Insulation Testers.